Rendering is the act of turning data structures into content, usually HTML. Before we go into the details of what data structures Drupal's rendering engine demands, let's consider an overview of how requests, responses and rendering all work together in Drupal. Drupal and Symfony communicate between themselves to determine how an incoming HTTP request should be dealt with, to generate the response, and to deliver the response back to the browser. This is often referred to as the Drupal 8 render pipeline; in practice, it's a set of embedded pipeline layers. DrupalKernel retrieves the Symfony HttpKernel (wrapped up with middleware using StackedHttpKernel) and calls HttpKernel::handle($request). HttpKernel determines the route matched by $request and the controller handling the route, using a KernelEvents::REQUEST event. HttpKernel checks to see if the controller has returned a Response $response object, or something else. HttpKernel passes any something-else that looks like a render(able) data structure on to the MainContentRendererInterface::renderResponse() method that matches the desired response content type e.g. HtmlRenderer::renderResponse(), using a KernelEvents::VIEW event. Renderer turns render(able) arrays recursively into markup. This might be considered Drupal's "rendering engine", and we'll describe it separately below. HtmlRenderer turns the markup into a HTTP 200 Response $response. HttpKernel permits just-in-time replacement of any placeholders (see below) using a KernelEvents::RESPONSE event. ChainedPlaceholderStrategy does one last sweep of placeholders, permitting modifictations; called from HtmlResponsePlaceholderStrategySubscriber::onRespond(). Renderer::renderRoot() make one more render pass over the content; unlike ::render() above, it injects placeholders. /index.php sends $response and terminates the DrupalKernel. Symfony's key contribution to the above is the HttpKernel and the concept of event subscription, which we've discussed in a previous tutorial. There are obviously other potential logical routes, to handle such circumstances as an uninstalled site, or a HTTP error condition (40x errors, 30x redirects etc.) but this captures the broad idea of a set of pipeline layers, each one handing off code execution to the layer below it (often using event subscription) and then dealing with the returned values. The deepest layer of pipeline above—the Renderer class—is available as the renderer service for the purposes of dependency injection (at the command line, \Drupal::service('renderer'). which we don't discuss here; handing-off points are usually identified by the presence of a #theme property in a renderable array. This layer handles the autodiscovery, parsing and caching of Twig templates, and the turning of provided further properties (node objects, user accounts etc.) into human-readable markup. Normally, though, your own code won't need to call any of these layers directly, as rendering is controlled entirely by renderable arrays: as we'll see next. Let's create another block in our custom module, and use that to demonstrate a number of possible options in renderable arrays. * Standard block constructor, but with addition of the current user service. We've discussed blocks previously, including dependency injection, so we won't reiterate on that; except to note that we're injecting the current_user service into our block, so we have access to the currently logged-in user's account. Includes tags not normally permitted for security reasons; requires a #allowed_tags array listing which are permitted. Includes a placeholder; placeholders are each themselves represented as render arrays, so they could be rendered at the last possible moment. Uses the username theme function, corresponding to the username.html.twig template. 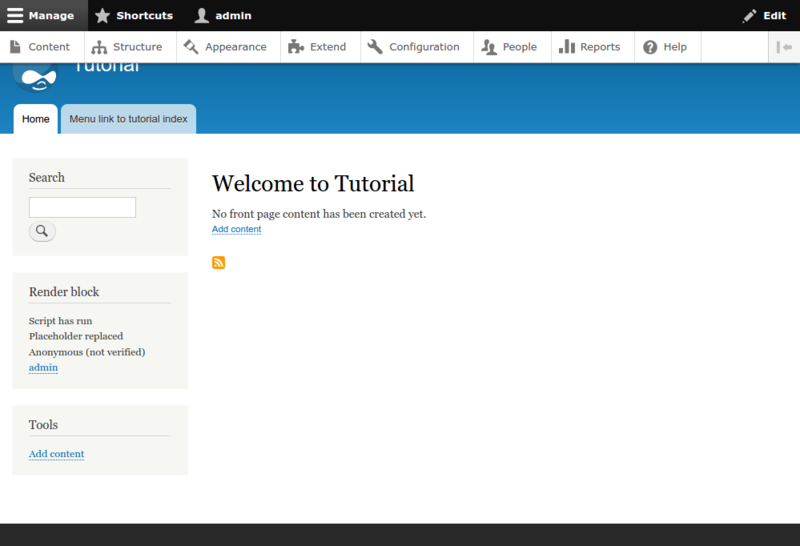 Uses the username theme function; this time, includes the current user's account as a #account attribute. These four are wrapped up in a containing renderable array, which uses the theme function item_list and references these children as the #items property. If you're tweaking this code to see how it works, be warned that, for logged-in users, blocks are strongly cached, and you'll need to clear the cache to see any changes. You can play with the #cache settings on any given renderable array, although that's out of the scope of this tutorial. Nicely, though, for the sake of this example: blocks are cached on a per-user basis; this means that the current_user won't accidentally show a link to user A in the block for user B.
Firstly, as is usually the case, you should install Drush, then rebuild caches so that Drupal finds the new block. As this has been discussed in previous tutorials, we don't discuss it here. For reference, then, you can use this service directly in future to trial all sorts of renderable arrays, and see how they turn out in isolation from the rest of the page's rendering. To enable the block created above, (as previously) you should log in and navigate to Structure > Block layout and click "Place block" by the "Sidebar first" region. In the modal popup you should see "Render block": click this and go through the process of adding it to the region as before. The results of the <script> tag, allowed to pass unfiltered to the browser and there executed. The placeholder text replaced during the final renderRoot() pass by HtmlResponseAttachmentsProcessor. The username theme hook, called with no account and defaulting to an unverified anonymous (and thus unlinked) username. The username theme hook, called with the current user's account and hence generating a link to that user's profile. If you can see all this, then congratulations! you have successfully returned renderable arrays from a block and demonstrated some of the potential of renderable arrays.